9. What is the target? The financial information NHS Improvement publishes each quarter is a useful source of intelligence on the NHS provider sector. The overall surplus or deficit of the sector understandably dominates most of the headlines, but NHS Improvement’s data also contains insights into the wider financial challenges facing NHS providers of hospital, ambulance, mental health and community services. Here we highlight nine pieces of information drawn from the most recent report covering the 2016/17 financial year, and our own quarterly monitoring report of NHS finances. The front-loaded funding settlement under the 2015 Spending Review made 2016/17 a year of relative plenty for the NHS. Funding growth between 2016/17 and 2020/21 will be very low by historical standards, as the NHS enters three years of lower year-on-year funding growth after 2016/17. The extra funding allocated in 2016/17 was meant to erase the aggregate financial deficit for the provider sector and give the NHS a stable platform to transform services. The addition of £1.8 billion in sustainability and transformation funding, and the introduction of financial control totals to manage provider finances, helped halt the rate of growth in financial deficits in 2016/17. But the provider sector still ended the year with a deficit of £791 million. The additional £8 billion of NHS funding for the next five years promised in the Conservative manifesto will not be enough to meet the pressures the NHS will face. Financial deficits in the provider sector are proving stubbornly difficult to shift, and this will limit the financial resources available to local leaders for transforming how their services are delivered in future. Reviewing the planned and actual financial performance for individual providers in 2016/17 highlights the vast swings in financial fortune different organisations experienced. Some providers performed significantly worse than planned. For example, St.George’s University Hospital NHS Foundation Trust and Brighton and Sussex University Hospitals NHS Trust planned for far smaller deficits than they eventually reported, and some providers like the Royal Free NHS Foundation Trust and Gloucestershire Hospitals NHS Foundation Trust reported deficits, even though they had planned for a surplus. Other providers vastly outperformed their own expectations, though a far smaller number fell into this category compared to providers who planned a surplus but ended up with a deficit. Guy’s and St Thomas’ NHS Foundation Trust and Central Manchester University Hospitals NHS Foundation Trust reported far larger surpluses than planned, while University College London Hospitals NHS Foundation Trust planned for an £11 million deficit but reported the third highest surplus in the country at £44 million. For some providers, their final position was heavily affected by one-off measures (alongside the day-to-day graft of finding opportunities to deliver care at lower costs). Providers that pulled off a significant transaction, such as a property sale, in 2016/17 or who met their control total and were rewarded with significant Sustainability and Transformation Fund bonus payments saw their finances dramatically improve against plan, while those who saw their transactions deferred until 2017/18, like the Royal Free NHS Foundation Trust, took a financial hit. It is likely that 2017/18 finances will be equally reliant on these types of transactions. Selling NHS assets or land is not something that providers do quickly or easily (at least not if they want to get the best price), and it also restricts opportunities for redeveloping NHS assets more strategically. There is a risk of the balance tipping towards short-term financial gains rather than long-term sustainability in NHS planning. The introduction of financial control totals and incentive and bonus payments for achieving financial targets also risks kicking a trust when it’s down, and may be a mixed blessing for trusts that did achieve their targets. Trusts that did not meet their 2016/17 control totals missed out on a range of funding support, which will compound the challenges they face in 2017/18. But even trusts who achieved their 2016/17 targets will face difficulties as late revenue income appears on their balance sheet. It isn’t easy to explain to staff – who have often coped with frozen vacancies and cost-saving drives over 2016/17 – why their trust has swung from a challenging deficit position to a sudden surplus. There will also be constraints on how and when this additional funding can be used by providers in 2017/18, with particular restrictions on using this funding for day-to-day revenue spending. When it comes to NHS finances, no organisation has an easy life at the moment and no sector is immune to financial pressures. For example, providers of mental health and community services are under significant pressure due to difficulties in accessing funding and increased demand for services. But is clear that the acute sector still continues to be the focus when NHS financial deficits are discussed. Providers of acute hospital services ended 2016/17 with a deficit of just under £1.2 billion with 61 per cent of providers in financial deficit, the highest proportion in any sector. The ambulance sector broke even, with the specialist, community and mental health sectors reporting surpluses in 2016/17. EBITDA1 – an approximate measure of cash flow – is often used as a measure of financial health in the NHS, and the acute sector EBIDTA of 2.8 per cent in 2016/17 was far below the 5 per cent threshold that was used to determine whether a provider had strong finances. As the demand for emergency hospital care continues to increase, it is likely that the acute sector will continue to contain the most challenged providers in 2017/18. 1. Earnings before interest, tax, depreciation and amortisation (EBITDA) as a proportion of revenue is an approximate measure of available cash flow (NHS Improvement). Providers delivered £3.1 billion of cost improvement savings in 2016/17, which was £266 million less than the sector had planned. One-quarter of the savings were delivered through non-recurrent means (ie, one-off savings that cannot be repeated year on year), which is far higher than had been hoped. Delivering more than £3 billion in savings each year is nothing to sniff at, especially as many traditional routes of savings are becoming increasingly difficult to use. Staff vacancies can only be frozen for so long, and full hospitals, overstretched staff and constrained commissioner budgets limit the opportunities for providers to grow their income to make-up for shortfalls in cost savings. Providers are currently planning to deliver £3.6 billion of savings in 2017/18. National programmes including Lord Carter’s review of operational productivity and the Getting It Right First Time initiative have helped identify more recurrent means of saving money in the NHS. But just under half (46 per cent) of NHS trust finance directors we surveyed were still either fairly or very concerned about achieving their savings plans in 2017/18. This represents a higher level of concern than that reported at the same time in our 2016/17 and 2015/16 surveys. The shortfall in savings for 2016/17 and the reliance on non-recurrent measures are almost identical to the issues we saw in 2015/16. This raises the question of whether the NHS should expect and plan for a more manageable level and mix of savings in 2017/18. While this will inevitably have consequences for the national financial position, it must be better for the NHS to plan for what it thinks is going to happen rather than what it hopes will happen in 2017/18. The financial data published by NHS Improvement clearly demonstrates the reliance of providers on the £1.8 billion of Sustainability and Transformation Fund money, which was available for the first time in 2016/17. But providers were also dependent on a number of other sources of financial support – such as interest-bearing loans and running down their historical financial reserves – to make their books balance in 2016/17. In our June 2017 quarterly monitoring report, 19 of the 69 providers we surveyed who needed financial support were dependent on both the Sustainability and Transformation Fund and additional loans in 2016/17. Twenty-nine providers ran down their financial reserves in 2016/17 in addition to relying on the Sustainability and Transformation Fund. This demonstrates that while the Sustainability and Transformation Fund has been helpful, it is not sufficient to bridge the financial gap facing the sector. A reliance on financial support from central bodies is not new in the NHS. In the past, public dividend capital and ‘winter resilience funding’ have been used to support the finances of NHS providers. But the current reliance on interest-bearing loans from central government to keep providers solvent raises (again) the question of whether this is an effective form of financing. It is hard to see how many of these loans will ever be paid back, and the additional pain of paying interest on loans is unlikely to instill additional financial rigour, as there appears to be more than enough financial pain to go around already. Nurses and other staff supplied through agencies play an important role in delivering NHS services. They may always be needed in a system like the NHS where demand fluctuates and the supply of substantive staff is constrained. But the increasing costs of agency and contract staff were in danger of putting untenable pressure on provider finances year after year. In October 2015 NHS Improvement introduced a set of measures to reduce this spending. These measures included ceilings on how much individual providers should spend on agency staff, and price caps for rates paid to agency staff. The NHS provider sector spent £2.9 billion on agency and contract staff in 2016/17, which was £550 million higher than planned but considerably lower than would have been expected without the new control measures, given historical year-on-year increases of more than 20 per cent. This reduction in spending on temporary staff was not easy to deliver. Individual providers had to act collectively to avoid bidding wars for staff within a region. NHS Improvement also had to manage concerns from geographically remote and reputationally challenged providers, who might be disadvantaged if they could not pay more attractive rates than other trusts. And all of this was happening against a backdrop of increasing demand for NHS services. While the costs of agency spending are moving in the right direction, questions remain over the future operation and extension of the policy. Some staff subject to public sector pay restraint have now also seen their incomes affected by reduced agency income. And it is unclear whether reducing agency spending has resulted in agency workers rejoining the NHS on substantive terms – especially where these staff chose agency work for the work-life balance and flexibility it can offer. Enforcing price caps for locum doctors has already proved difficult (particularly in specialties experiencing workforce shortages) given the different market conditions they operate under. And finally, while agency costs are contained, the fundamental underlying problem remains – the NHS does not have enough staff to meet the demands it faces. 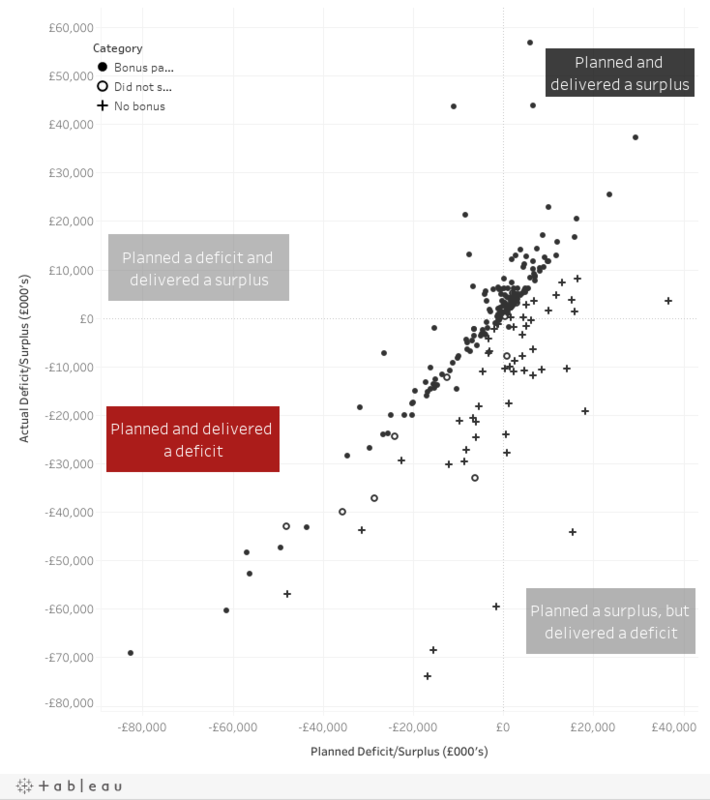 The mismatch between planning aspirations and financial reality is perhaps clearest when looking at capital spending in the NHS (spending on high-cost items with a useful life expectancy of more than a year). NHS trusts and foundation trusts submitted initial spending plans worth £4.1 billion for 2016/17, which was far above the Department of Health’s target of £1 billion for trusts and £1.7 billion for foundation trusts. No wonder then that providers were contacted by NHS Improvement in the last quarter of 2016/17 and asked to stop or defer spending where possible. This resulted in an already reduced capital plan for £3.3 billion being cut further to £2.9 billion. These deferred plans come at a cost. The physical estate and assets of the NHS are being increasingly run down, and the cost to eradicate just the backlog of ‘high-risk’ maintenance work increased by 69 per cent to £776 million in 2015/16. Some plans for strategic capital investment in building health campuses and developing NHS land have also been delayed. Our June 2017 survey of finance directors also found providers were delaying or deferring capital spending or payments to suppliers as the end of the financial year approaches. While this may help the financial position of the NHS in 2016/17, deferred payments do not ultimately solve the financial pressures the NHS faces – suppliers will need to be paid eventually. The 2017 Spring Budget provided an extra £325 million in capital funding over the next three years for the ‘strongest’ sustainability and transformation partnerships. The Conservative Party manifesto also committed to the ‘most ambitious programme of investment in buildings and technology the NHS has ever seen’. The variance between provider plans for capital spending in 2017/18 (reported to be £4.3 billion) and the Department of Health’s targets highlights the need for a more concrete and co-ordinated response to Sir Robert Naylor’s review of the NHS estate to translate these commitments into reality. The introduction of sustainability and transformation funding in 2016/17 had a clear aim of stabilising the finances of providers of acute emergency care, as they were judged to be under the greatest financial and operational pressure. The dramatic fall in the value of local financial sanctions applied to providers reflects this approach, as the traditional ‘stick’ of financial sanctions (eg, fines for failing national performance standards on A&E) were replaced by a withheld ‘carrot’ (ie, access to a portion of Sustainability and Transformation Fund money was contingent on providers achieving agreed improvements in waiting times). But although local financial sanctions decreased, national business rules such as the marginal rates for emergency care and readmission rules still financially penalised providers who saw their levels of emergency activity increase. Organisations in sustainability and transformation partnerships are now working together more closely to manage and share financial risks across both providers and commissioners. It will be interesting to see if this results in more, rather than fewer, arrangements that pay providers on a marginal basis (rather than full price) for the work they undertake. The impact of constrained NHS capacity is also evident in the increasing costs of outsourcing both hospital and out-of-hospital care to other providers, and the increased costs of waiting list initiative sessions (in which higher rates are paid to consultants to work in evenings and weekends to meet waiting time targets). Providers will be faced with the unenviable task of managing increasing demands for emergency and elective care, with longer-term ambitions to reduce the number of hospital beds, and a more immediate ambition to reduce the costs of outsourcing work. It is likely that waiting times for elective care will increase as providers try to balance this equation. This action may be supported by the announcement in Next steps on the NHS five year forward view of the downgrading of the elective waiting time target (after which 15 per cent of CCG finance leads we surveyed indicated they may seek to reduce the level of elective activity they have contracted for in 2017/18). However, it is hard to see how this would be compatible with the June 2017 letter from NHS Improvement exhorting providers to honour their waiting time commitments in the NHS Constitution. £0 million December 2015 – NHS shared planning guidance sets out ambition that ‘During 2016/17 the NHS trust and foundation trust sector will, in aggregate, be required to return to financial balance’. July 2016 – The NHS ‘financial reset’ notes that ‘the existing provider plans… would result in an aggregate provider deficit for 2016/17 of £580 million’. -£250 million July 2016 – But the same ‘financial reset’ document notes that ‘additional actions’ such as consolidating clinical services and tackling the growth in staff pay costs at some providers could deliver a provider sector deficit of around £250 million. -£873 million February 2017 – By the time the quarter three provider finances were published the forecast end-of-year position had deteriorated to a deficit of £873 million. It was hoped that by intensive support to providers in the last few months of the year this position could be improved to a deficit of between £750 million and £850 million. June 2017 – At the NHS Confederation conference the pre-audited figures for the provider sector suggested an end-of-year deficit of £735 million. -£791 million June 2017 – The actual final position was £791 million after audits were completed in May 2017. The final audited financial position was £56 million worse than the draft accounts, as transactions and land sales for some providers were deferred into the 2017/18 financial year. We end where we began ­­– with the aggregate provider financial position. Over the course of 2016/17 the financial objective for the provider sector was a moving target. The original intention for 2016/17 was for the sector, in aggregate, to return to financial balance. By July 2016 this ambition had been reduced, but there was still hope in parts of central government that the deficit could be brought down to £250 million if growth in staff pay costs could be contained; back-office and pathology services could be consolidated (in-year); and elective acute care services reliant on high levels of locum medical spending could be consolidated or transferred to a neighboring provider (again, in-year). The final outturn of a £791 million deficit was therefore either £211 million worse than plan, £541 million worse, £791 million worse, or even £82 million better than forecast, depending on which financial target you opt for. There is a painful symmetry in how financial targets for 2016/17 and 2017/18 have developed. The shared planning guidance for 2017/18 again noted the ambition that ‘at national level, the provider sector needs to be in financial balance in each of 2017/18 and 2018/19’. But provider plans are already suggesting a deficit of £500 million in 2017/18. In June 2017, our quarterly monitoring report, which has been a fair barometer of how NHS finances pan out over the year, reported that just under half (43 per cent) of all trusts we surveyed were forecasting ending 2017/18 in deficit. This demonstrates how important it is for the NHS to have a clear, shared and credible understanding of what this year’s financial target for the provider sector is, so more time can be spent on achieving it and less time spent debating it. Looking back at 2016/17 more broadly, although provider finances were better than in 2015/16, they were worse than providers had originally planned. NHS providers and the central bodies worked incredibly hard throughout 2016/17 and made considerable progress, but this was still not enough to close the financial gaps facing the sector. It isn’t sustainable for staff in local providers and national bodies to keep doing their best to deliver high-quality services while continuing to make financial savings, even when they suspect these savings won’t be enough to maintain financial balance. But this tension will continue to operate at every level of the NHS until we either recalibrate our expectations to meet the available funding, or recalibrate the funding to fit our expectations of the level and quality of care we want to deliver.